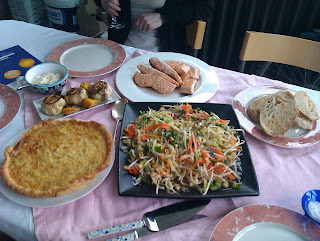 Cookery Book Supper Club: Roast Chicken and a Whole Lot More! Roast Chicken and a Whole Lot More! My copy of Roast Chicken and Other Stories by Simon Hopkinson proudly bears a big yellow sticker proclaiming it to be the most useful cookbook of all time (as voted by Waitrose Food Illustrated) so with such a provenance it was only right that it should feature at the cookery book supper club. The style of taking one ingredient and offering various recipe suggestions was novel in 1994 when it was first published and there have been many imitators; the most recent being Bryn’s Kitchen. So from anchovies to veal we are taken through a culinary alphabet of Hopkinson’s favourite ingredients and given a little insight about either the food or the recipe. 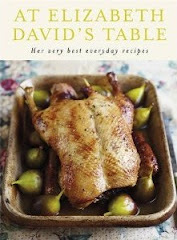 We liked the fact that Simon gives you plenty of alternative ideas for a recipe and that the book is well indexed. There is a wide variety of dishes and the connections between chefs and the provenance of the recipe is explored to such an extent that it’s like reading a little recipe family tree. Some of the stories are amusing too. We thought it was a good manageable size and liked the flaps (great as bookmarks). There are some classics in this book that most culinary enthusiasts would agree should be in everyone’s repertoire namely the famous Roast Chicken and the St-Emilion Au Chocolate. On the downside some comments are a bit outdated now (see Veal) and some recipes a little vague, 2 or 3 tomatoes? The surprise pudding was not a great success for Sarah and made her wonder if the recipes had been fully tested? Perhaps our sensitivity to recipes laden with cream and butter has been heightened since the book was published so some recipes can seem a bit too rich. Simon sounds a bit like a grumpy old man at times!! We are all enjoying Simon’s new TV series a no nonsense simple approach to good cooking and great graphics to boot.